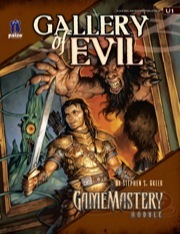 Steve Greer’s latest masterpiece, Gallery of Evil, was released this week. I’ve been anxiously awaiting this adventure, as the theme is a departure from what you normally see. The great city of Absalom is known as a center for trade, education, and art. Inside the Ivy District reside dozens of famous artists, but one has the talent to bring his paintings to life and use paint to conjure terrible monsters bent on destruction. Can the player characters stop the mad painter before he perfects his art? popular fantasy roleplaying game. This adventure includes details on the metropolis of Absalom’s Ivy District, as well as the home of the diabolical artist and his twisted works. The PCs must track down the deadly paintings and discover the true identity of the artist behind it all. This adventure is the first to feature information on the metropolis of Absalom, one of the largest cities in the Pathfinder Chronicles Campaign Setting. When I first read the summary, it reminded me of “Portrait of the Artist as a Young Necromancer”, an RPGA module Jim Lowder wrote back in the early 90s. Another great adventure about ‘killer art’; if you can find a copy, I highly recommend it. This entry was posted on Saturday, October 6th, 2007 at 01:34 and is filed under Uncategorized. You can follow any responses to this entry through the RSS 2.0 feed. You can leave a response, or trackback from your own site.